The EAA Witness P Compact polymer features include integral locking system, auto firing pin block, windage adjustable sight and grip extension. Unlike most other semi-automatic pistols, the slide rides inside the frame rails rather than outside. This provides a very tight slide-to-frame fit, very good barrel lock-up and contributes to good accuracy. 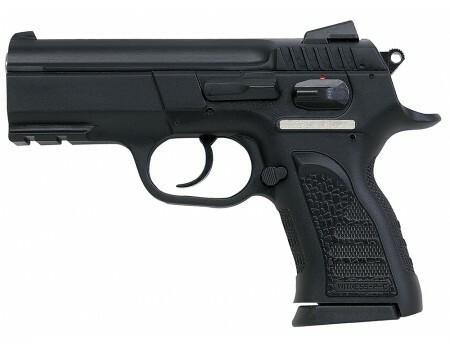 It is also one of the few production semi-automatic pistols available in the 10mm Auto. This product may be restricted for sale in California, Connecticut, Hawaii, Massachusetts, Maryland, and New York. Please contact your FFL or call us at 800-217-2998 before purchasing to verify product restrictions.